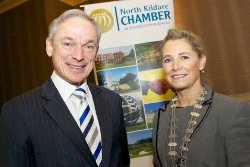 North Kildare Chamber held their annual conference in the Killashee House Hotel (24th October) with over 200 business delegates in attendance. Minister Richard Bruton TD officially opened the conference and spoke of how important job creation is to the economy making particular reference to the recent announcement of the Kerry Group and how Kildare can play its part in driving an improving economy. Speakers at this year’s conference included Ruth McEntee from YouTube, Oliver Kelly from Kerry and Ciaran Creen from mickgarages.com. Networking was very evident during the conference and delegates had ample opportunities to visit the trade stands on show and meet with local Kildare businesses. Companies who attended the conference included The K Club, Open Sky Data Systems, Ballymore Group, Tesco Ireland and Lily O’Briens. The theme of this year’s conference was “Driving Kildare Forward” and with speakers such as Linked Finance and John Dunne from JF Dunne who also spoke, everyone in the packed conference room were left in no doubt that working together Kildare is and will remain to be an excellent place to work and live in. North Kildare Chamber President, Eilis Quinlan spoke on how whilst job creation is hugely important going forward, job retention is equally important. Eilis informed the packed conference room on how both Chambers in Kildare are going forward to EGMs shortly and that by creating a County Kildare Chamber, the organisation will become one of the largest business representative organisations in Ireland.